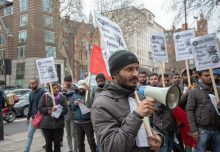 Last year on the 4th of February Tamil solidarity organised a protest against the Sri Lankan High commission celebrating its 70th independence. The protestors grew in number and Tamil Solidarity activists were in the forefront raising awareness as well as pointing out their hypocrisy in celebrating independence whilst denying the very rights of it’s minorities and poor. 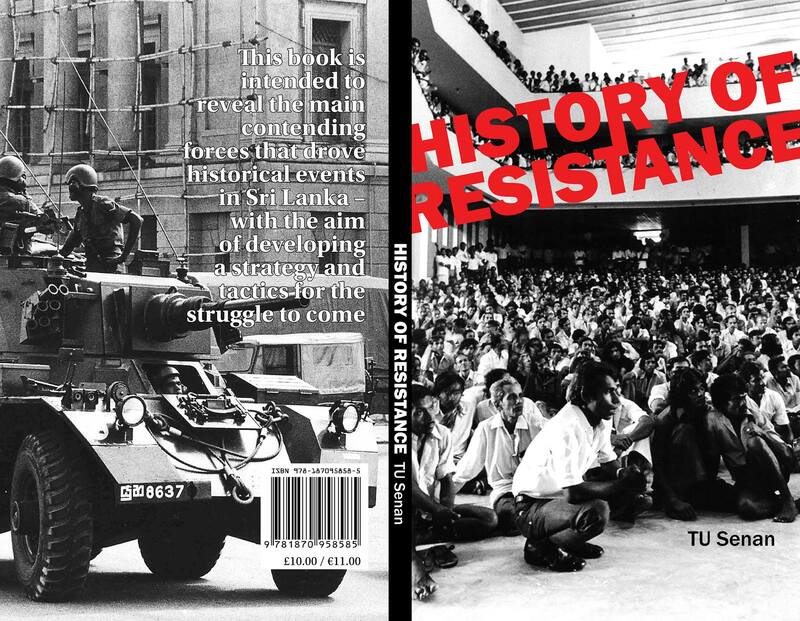 It is during this protest that the then Defence attache sent out death threats to the protesters in a bid to silence them. This led to various activists filing a complaint with their local police under the charge of threat to kill. Three is also a case taken up against the Brigadier which resulted in an arrest warrant being issued without bail last week by Westminster Magistrates. However the foreign office in Sri Lanka had put humongous pressure on the foreign and commonwealth office in the Uk which then led to the withdrawing of the arrest warrant made against the Brigadier. The reason that was given for this action is that the brigadier has a “diplomatic immunity”. The case against the taken up by three activists who pushed towards a private prosecution was heard once again at Westminster Magistrates. 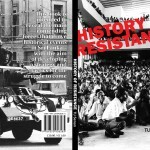 Tamil Solidarity activists had already planned a demo and a peaceful protest outside the courts with regards to this. The protest grew in numbers as other Tamil Diaspora organisations joined hands to show their protest against the withdrawal of the arrest warrant even though the weather had been abysmal. Meanwhile in the courts lawyer Paul Heron from the PILC along with other legal professionals argued that as Mr. Fernando is not currently in the UK, his diplomatic immunity cannot be used as a defence. Peter Carter QC, for the protesters also pointed out even though diplomatic immunity can be enjoyed for special functions it certainly will not protect him for what was clearly not authorised activity, i.e sending out death threats in the form of slit throat gestures not once but thrice. 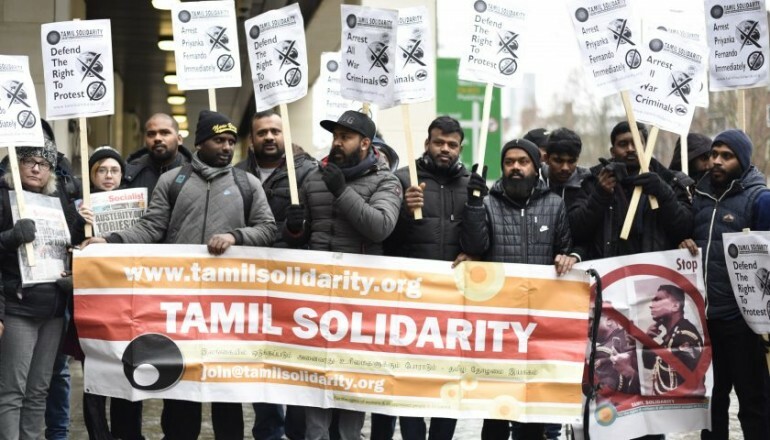 It has to be noted that activists from Tamil Solidarity put forward their key demands such as release all political prisoners, justice to be delivered to Tamils and opposed the use of political influence in the courts by the Tory government. This was seconded and led to chants being shouted outside the magistrates by other protesters and activists who had joined hands to show their protest.Tamil solidarity also demanded an immediate arrest of Priyanga Fernando and defended the right to protest. The defence lawyers for Mr. Fernando had asked the magistrates for more time to prepare their defence regarding the allegations put forward by the victims, legal side. Therefore the case has been deferred to the 1st of March 2019. Tamil Solidarity is planning to hold another demo and protest outside Westminster Magistrates on the 1st of March 2019 to show our protest against this alleged war criminal who had also threatened to kill Tamils living in Britain.. We urge all Tamils to join hands with us in this protest.